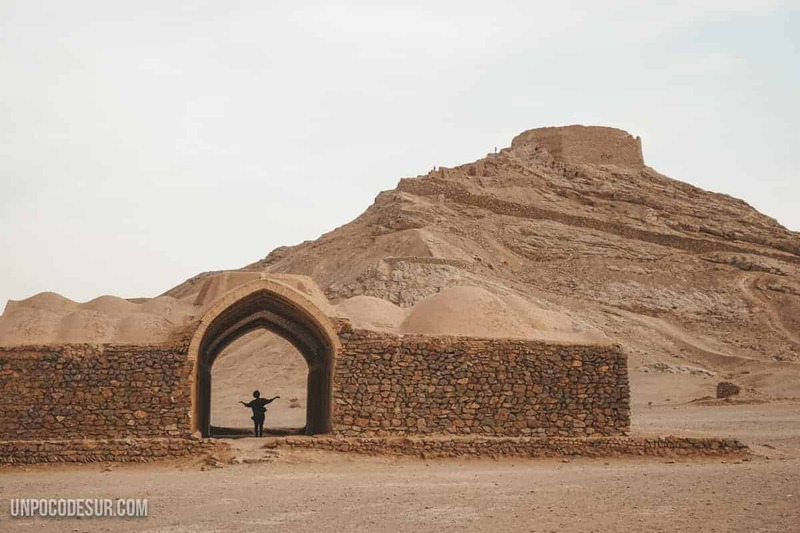 1 What to see in Yazd? 2 How to get to Kharanaq? 3 Where to sleep in Yazd? 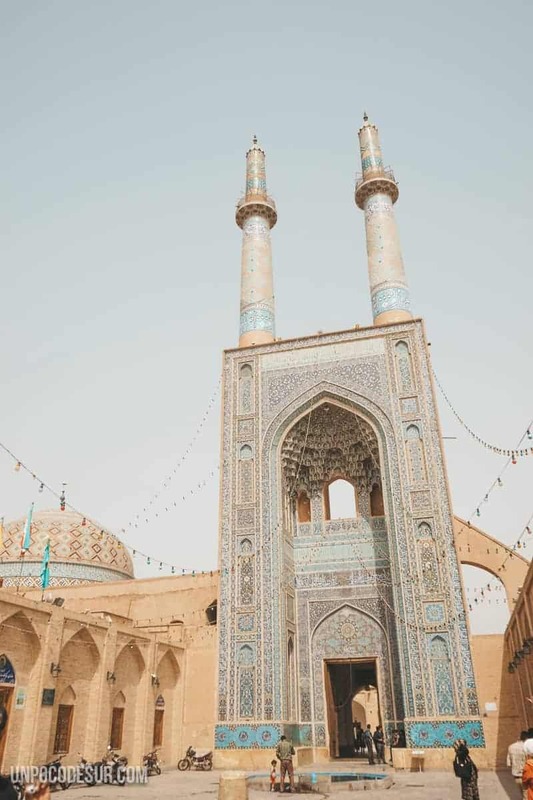 After our fast return to the capital to pick up our newly acquired visa for India, we decided to continue with our planned tour and we took a night bus to Yazd where we spent the night while we were moving for 540.000 rials both. Once at the bus station we took a completely battered bus that would take us to the city centre for only 5.000 rials per person.As soon as we started entering the city we realized that was huge and for a moment we wondered if it would really have been worth it. 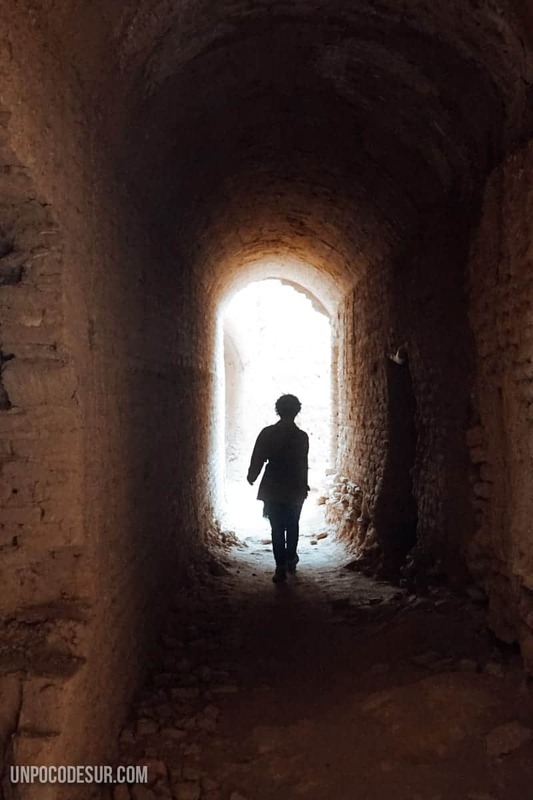 After a few traffic jams, we were finally inside the remains of the historic city centre, you see it pretty fast, especially in the towers that come out of the vast majority of buildings (cooling and ventilation towers) made in adobe, one of the most peculiar features of the Yazd. 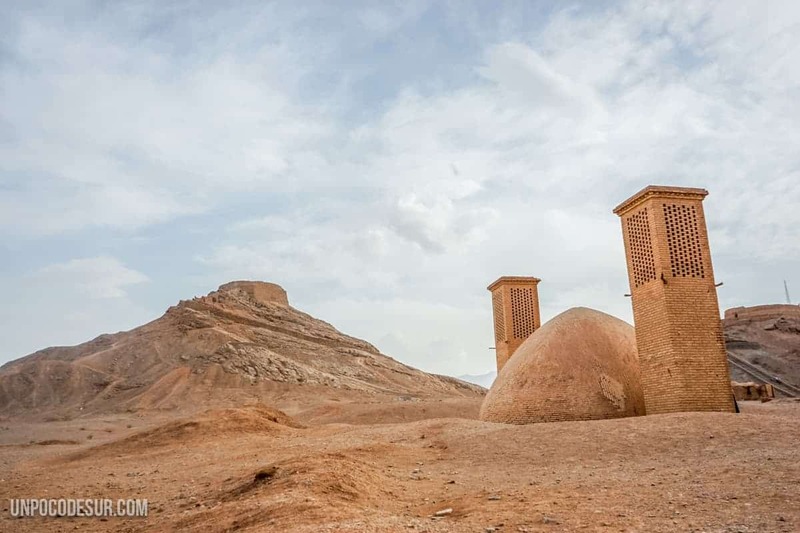 The Badgir, those ventilation towers you will see coming out of all or almost all buildings, are what we know today as air conditioning, they catch the wind that passes above the rooftops by making it circular tru the buildings while cooling it with water. 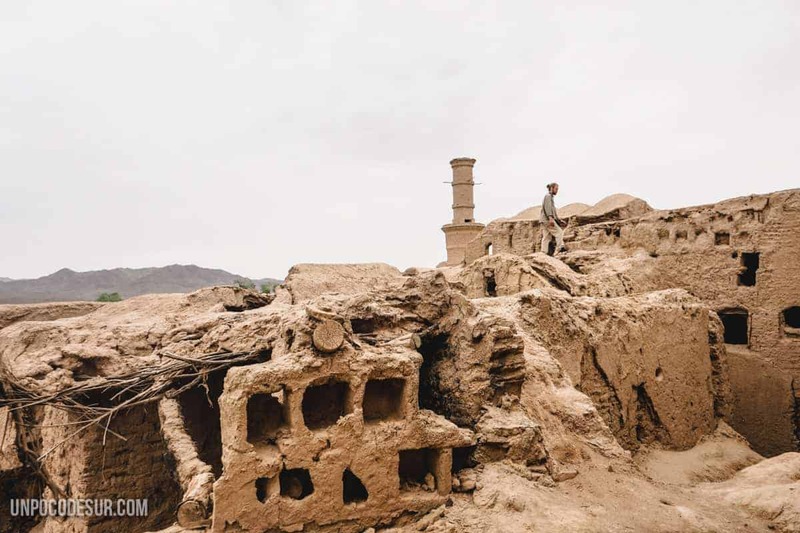 We saw them also adapted to modern constructions and taking into account that they have been so long in these part of the world we are sure that this is an excellent cooling option, especially if it is considered the super dry climate surrounding Yazd. 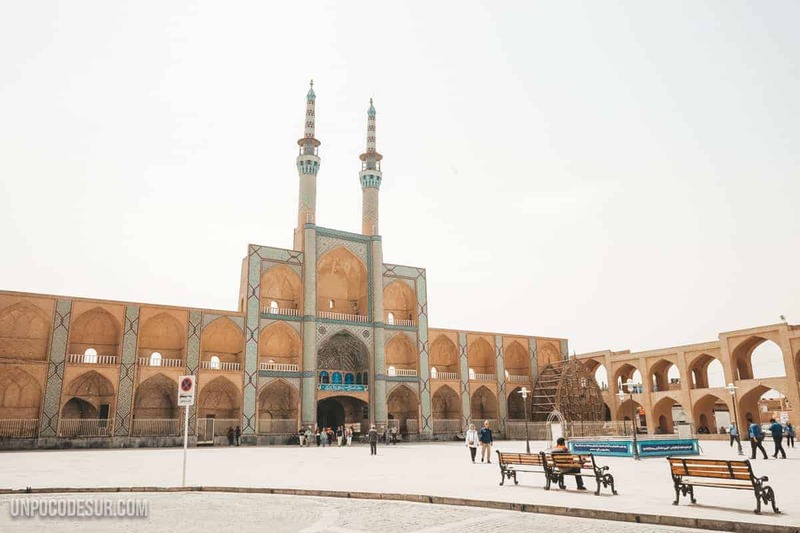 What to see in Yazd? Once we got off the bus at the historic city centre we fell in love. If Abyaneh was red Yazd was pure adobe, brownish, present in each of its streets and the contrast with the blue and green of the massive mosques was impressive.Soon we ran into the main mosque, Masjed-E Jameh-e Yazd imposing, high and a dazzling blue, from there the eternal labyrinth of dead alleys that we will soon discover throughout the city begins. So the great mosque is one of the visits that many consider indispensable. We have our point of view about paying for religious sites, especially taking into account the repression that the country suffers, so we decided not to do it, but I’m sure aesthetically will be worth it.Don’t worry if you prefer not to visit the insides, from outside you can see all its daily routine and will be its towers that will guide you once walking around the city. Another of the places that architecturally speaking will not leave you indifferent thanks to its strong right angles, it is the Amir Chakhmaq complex, located in the homonym square. 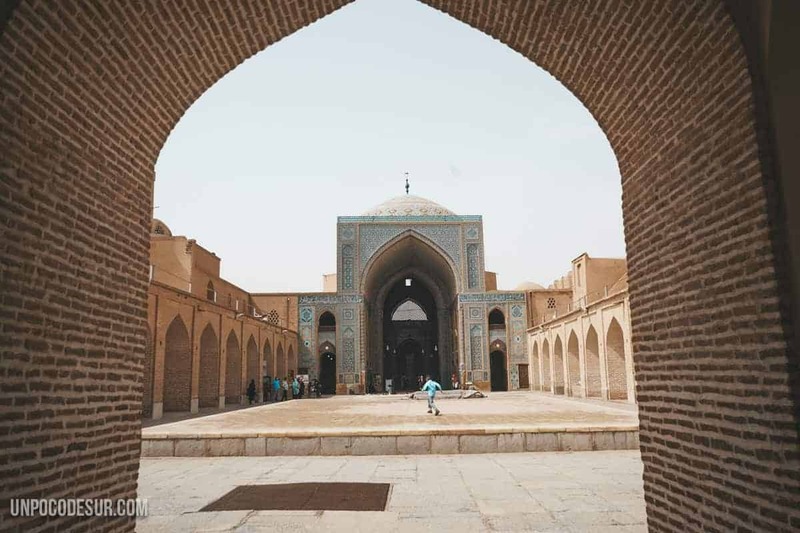 There are references to the square already in the 15th century and it was built in front of which today is known as “the ancient mosque” that was not decorated in the way we see it now until the Safavid era in the 18.th century. Is important to keep in mind that, as we saw during our visit to Abyaneh, the Zoroastrianism had a very important role as well in Yazd. Iranians were Zoroastrians long before Islam was installed in the area and it is still possible to find small strongholds of the past, especially in this area.One of those redoubts is once again a temple of fire, one of the temples with the highest status still present in the country, the rest of the temples of this level are located in India, so it is a special and unique place. Without a doubt, the best thing for us was to walk aimlessly through the streets of the city, it was the first thing we did for hours and hours until the heat was unbearable, then, when the sun fell, we went back to the dark streets full of warm light and colours transporting us to another place in time. I can’t imagine an activity more necessary, more beautiful and more entertaining than just getting lost by the adobe of its streets looking for treasures. The main dish is what tourists know as “the tower of silence”. located outside the city consists of a high circular area in which the Zoroastrians left the bodies of the dead exposed to the carrion birds of carrion so the death will not contaminate one of their sacred elements, water, earth and fire. This practice has been recorded since 500 a. C, but the use of the towers is not documented until the 9.th century. The whole complex is simply impressive and we were all afternoon around walking, around while reading the Wikipedia and talking to the locals. 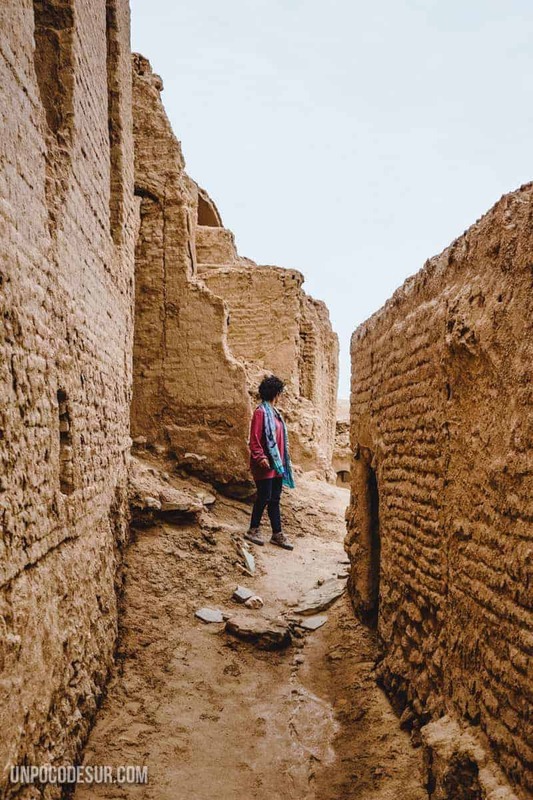 Ticket price (2017): for non-local is 150.000 rials Opening Hours: from 8 AM to 1 PM and from 4 PM to 6 PMVisit the ” abandoned” village of KharanaqOne of the most common visits for those on tour around the country is the one day visit to Kharanaq, an adobe town supposedly abandoned located about 80 km from Yazd. Khanaraq means “land of the sun”.Is important to have the correct expectations as we love abandoned places, in this case this is not. The village as such is not abandoned. Karanaq has two parts, the old part, completely made of adobe and falling to pieces uninhabited in its entirety, and the new part, directly next to it, where today about 200 families live (in perfect conditions). In any case, you will be probably talking about the first, a lattice of streets and buildings built with mud that once was a prosperous village, according to what we heard its there for more than 4000 years (wot? ). The legend says the village had water supply problems and its inhabitants left the place. Today the day has been repopulated as basic services have arrived at the area. How to get to Kharanaq? Since the town is way out the main route it happens the same thing that happened to us with the remote village of Abyaneh, public transport seemed not to be a viable option. What we did was take a public bus to Meybod (from which we got down at the intersection that goes to the right, check the map) for 5.000 rials each and there we hitchhiked. Luckily in this case, Kharanaq is not a dead end, but also not the busiest street in the world, so it’s important to have patience, we still got there without much effort. 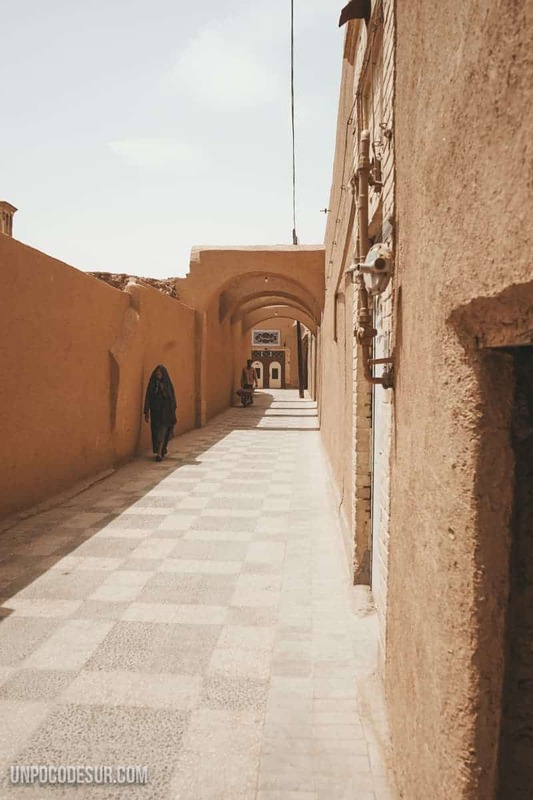 If you don’t want to hitchhike, you have again two options:TaxiYou can hire a taxi driver to take you there, wait for you and return you to Yazd. The price for the full the car is usually around 900.000 rials and up to 4 people. If you are a group is not a bad option at all. Again it is important that you agree beforehand what are your intentions and what other places you want to visit.A spot in a tour The most common option is to visit the place by the hand of an organized tour that usually cost about 500.000 Rs per person and includes stops in other locations such as Meybod and Chak Chak. The tour can be hired in almost any hostel/hotel in Yazd. 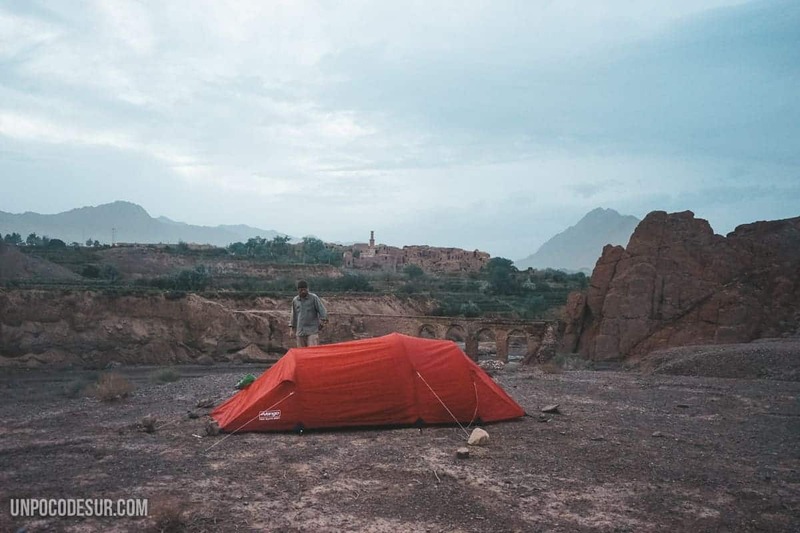 As far as I understand, there are no places to sleep in Kharanaq, we crossed across the river admiring the beautiful aqueduct of the city and camped there with an amazing view. Where to sleep in Yazd? The ideal thing is finding accommodation in the city centre, so you can do everything or almost everything walking without any problem. 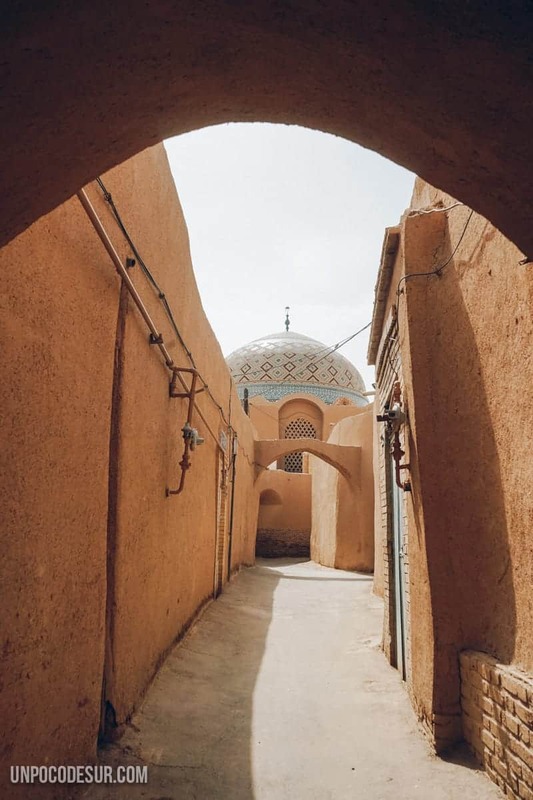 Yazd is a city more used to tourism than others, a little in the style of Isfahan, that’s why your accommodation options are slightly more expensive. 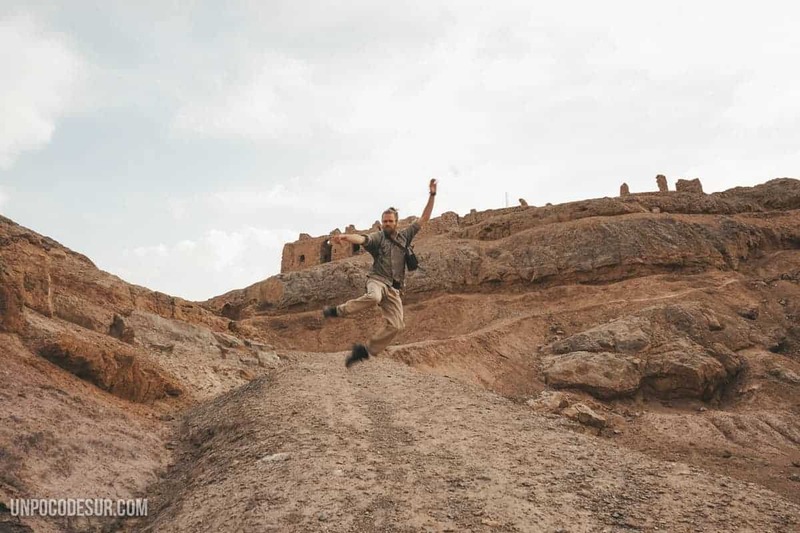 In our case, Yazd was the first time in Iran where we opted for a hostel, but truth be told, it is one of the most beautiful places where we have been too, in addition to having unique hosts. As we do not usually stay in accommodation where there are many tourists was also an ideal place to socialize. 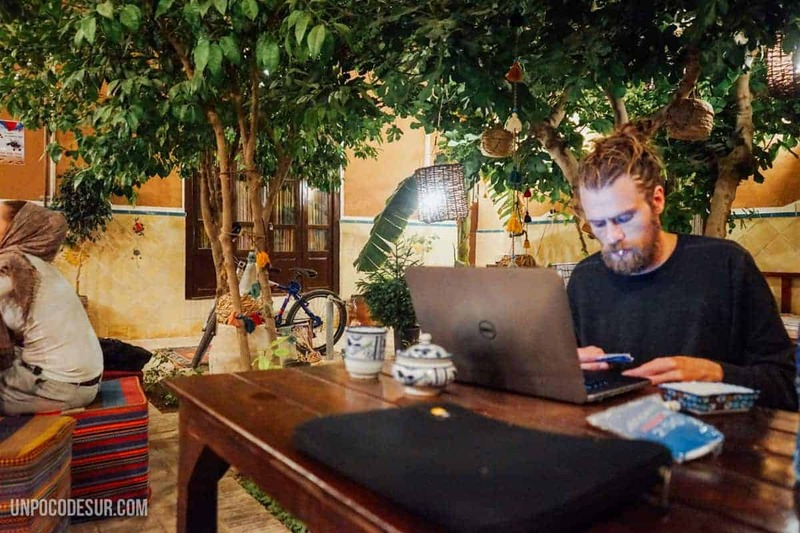 In any case, the Kaluts Hostel has a shared room for 6 people with mattresses on the ground at the pure Iranian style in an old house in the city with a spectacular interior courtyard. If you prefer something more private they also offer private rooms at a higher rate, some of them with a direct door to the patio, trust us when we say they were beautiful. We paid 725.000 for both, about 15 € and the price included a spectacular breakfast.If you ask us what was our favorite city in the country we don’t have a single doubt, was Yazd.